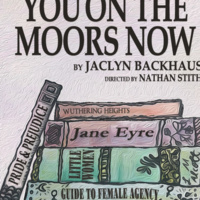 Trinity Theatre presents You On The Moors Now by Jaclyn Backhaus directed by Nathan Stith. This crazy, funny show sets heroines from the 19th-century novels of Louisa May Alcott, Jane Austen, and the Bronte sisters in a mythical place of Moors. When our heroines receive proposals of marriage, they decide to escape. The men wage war on the women, starting the Moors Wars. All productions are in Stieren Theatre, Ruth Taylor Theatre Building, unless otherwise indicated. Tckets: $12 regular, $8 faculty/staff/alumni/senior citizens, $6 students. For reservations, call 210-999-8515. Curtain times: Friday and Saturday at 8 p.m., Sunday at 2:30 p.m., Wednesday and Thursday at 7 p.m.